You may feel as though a wheat allergy is a tough one to manage, considering that wheat ranks as the most predominant grain in the United States. But there are a number of alternative grains that you can substitute for wheat, including ones that make good wheat-free cereal and bread options. You may be avoiding wheat due to an allergy or intolerance to gluten, a protein found in wheat, rye and barley that causes the autoimmune disorder celiac disease. If that's the case, it's important to note that a food considered wheat-free is not necessarily gluten-free. Wheat is considered a major food allergen, similar to eggs, milk, nuts or shellfish. To help people with food allergies avoid foods that make them sick, the Food Allergen Labeling and Consumer Protection Act was enacted in 2006. This law requires food manufacturers to clearly label foods that contain one of the major food allergens, including wheat. When looking for wheat-free foods, look for the word "Contains" to see if wheat is listed. While this law may make shopping for wheat-free food easier, it is still recommended that you carefully read the ingredient list of all foods to see if they contain wheat or any wheat derivatives such as cereal extract or hydrolyzed wheat protein. You can find a number of different types of ready-made wheat-free bread at your local grocery or health food store. These breads are usually made with rice, corn or tapioca flour. In addition to sliced bread for sandwiches, you may also be able to find wheat-free hot dog or hamburger buns, English muffins or rolls. Read food labels to find the healthier wheat-free bread options. Look for varieties made from whole grains that have 2 to 3 grams of fiber per slice. If you like to bake, you can try making your own wheat-free bread using a suitable flour, such as rice, potato or tapioca. Most wheat-free recipes use a blend of a few different flours. The key to baking wheat-free bread is xanthan gum, which is a food ingredient that helps hold the flour together in the absence of gluten. Wheat-free bread mixes are also available, some of which can be whipped up in a bread maker. 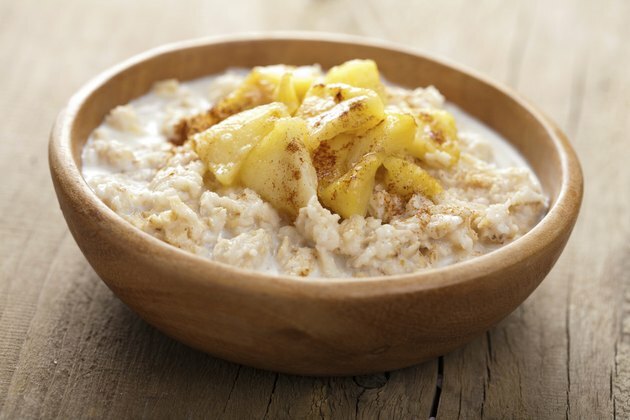 Oatmeal, grits and cream of rice are all wheat-free hot cereals. Millet is also wheat-free and eaten as a porridge in Africa. You can find a number of wheat-free ready-to-eat cold cereals, too. Options include puffed rice and certain brands of crispy rice cereal and corn flakes, as well as brands that cater to people with allergies that offer a variety of wheat-free cold cereal options such as wheat-free granola, buckwheat and hemp flakes and crunchy corn-based cereals.